HP has introduced its new ENVY 13 premium laptops based on Intel’s Core i-series Kaby Lake processors. The notebooks resemble their predecessors featuring Skylake CPUs, but naturally offer all the advantages that Intel’s latest chips have, including higher performance and better energy efficiency. Other notable enhancements over the predecessors are a new battery and a USB Type-C port. In addition, HP reduced the starting price of the ENVY 13 to $849, down from $899 in case of the previous-gen model. 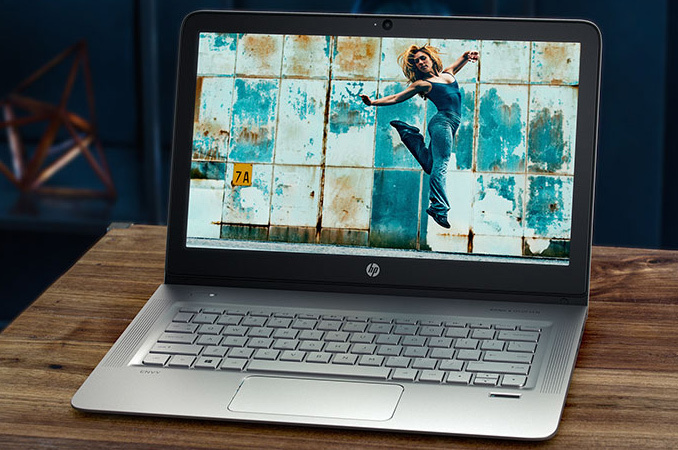 The HP ENVY 13 2016 uses exactly the same chassis as its predecessor released a few years ago. The PCs feature lifted hinge design to enable more comfortable typing (says HP, others may disagree) and are made of machined aluminum and magnesium. As for weight and dimensions, they are up to 12.95 mm thick and they weigh up to 1.49 kilograms (3.3 lb) depending on the actual configuration. Display panels of the ENVY also remained the same: HP offers a choice between a QHD+ (3200×1800) IPS panel (with or without touch support) and an FHD (1920×1080) IPS panel. Internally, the HP ENVY 13 also resembles its ancestor with 8 GB of DRAM (optionally upgradeable to 16 GB), 128 GB SATA AHCI or 256 GB/512 GB/1 TB PCIe NVMe SSDs. The new HP ENVY 13 is also equipped with a 802.11ac 2×2 Wi-Fi + BT 4.1 controller, a backlit keyboard, a webcam and so on. Among external ports, the ENVY 13 offers one USB 3.0 Type-C, two USB 3.0 Type-A, an HDMI output, a TRRS connector as well as a microSD card reader. 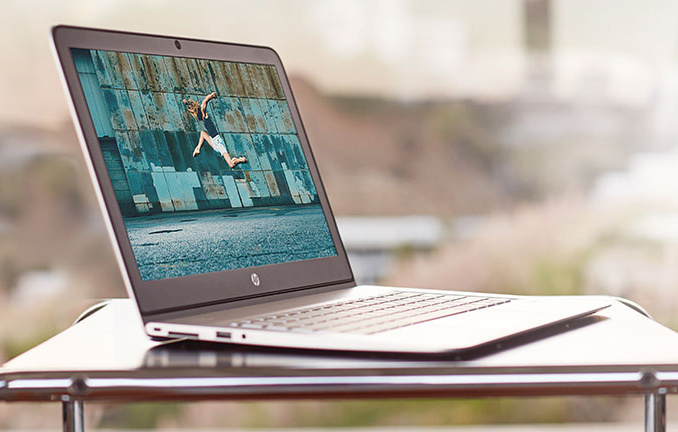 The key improvement of HP’s ENVY 13 over previous-gen model is its processor: the manufacturer offers to install either the Intel Core i7-7500U or the Intel Core i5-7200U with Intel’s HD Graphics 620. The new CPUs feature higher frequencies, considerably improved video encoding/decoding engine, refined graphics as well as Speed Shift v2 technology, which should make the new ENVY 13 snappier and more responsive in general. It is also noteworthy that HP uses hyperbaric chamber cooling for its premium notebooks (ENVY 13, Spectre, etc. ), so, everything should run more or less cool and quiet. Yet another improvement of this year’s ENVY 13 is the new 57.8 Wh battery, up from 45 Wh on the previous-gen models. The higher battery capacity along with improved energy efficiency of Intel’s new CPUs will naturally prolong battery life of the new ENVY 13 laptops: HP claims about up to 14 hours, but everything depends on actual configuration and usage model (a notebook with a QHD+ display will not last that long). Finally, HP decided to lower the price of the entry level ENVY 13 (Core i5-7200U, 8 GB of RAM, 128 GB SSD, an FHD panel, etc.) to $849, down from $899. The machines with higher performance and better displays will naturally retail at higher price points, when they hit the market in the coming weeks. I'm confused as to what you're looking for here. Apple has had a 13" laptop with a 2560x1600 screen for 4 years now (granted that's almost 30% less pixels, but it is a preferable aspect ratio and comes standard even on the base model). Of course they won't be shipping a Kaby Lake version until the GT3 parts are available since Apple generally doesn't do GT2. However, Intel paper launched Skylake-U 2+3 in Q3'15, despite them not shipping until Q1'16, and as far as I can tell have only been available in the Vaio Z and Vaio Z Flip since then. Furthermore, Intel's roadmap from nearly a year ago showed Kaby Lake-U 4+4 as TBD, and 2+3 as week 6-18 2017, so I wouldn't exactly be holding my breath for a Kaby Lake MacBook Pro release this month. Yeah, but sorry gonna say it - but its a Mac, which is filed into the 'who cares' as far as I'm concerned. I'd like to be compatible with the other 90% of the computing community. Nobody has ever handed me new software to interface with a new Network Element, and said, oh but sorry, this only runs on a Mac. But I've seen SO many Macs running Windows. I love XPS screens (especially bezels)... but I don't like soft touch material they use for palm rest. Whenever I see XPS in the shop, they look quite greasy and "mushy"... material seems to be very fingerprint-friendly. When I look at XPS in computer shop, it always look more worn than surrounding full-metal machines, because of that finish. It is all mater of taste, but personally, I don't like it much.